I wanted to make something interesting today, but because it is so FREAKING hot this week, baking didn’t have its usual appeal. I was hoping to find a good creamy dessert or perhaps an ice cream cake, but thanks to a friend on Facebook, I got an even better suggestion — Souffle Glace Aux Framboises. As mentioned earlier, this dessert sounds fancy and it does make a great presentation, but it’s really quite simple if you have the time. You’ll need an hour and a half to bake the meringue shells and at least 4 hours freeze-time. You’ll also need a soufflé dish to which you’ll have to attach a little homemade sleeve. The original recipe calls for an 8 inch, but I only had 3 ½ inch soufflé dishes so I halved the recipe and made just one. Here’s a re-formatted version with a few notes mixed in. Preheat the oven to 200 F. Line a baking sheet with parchment paper. Draw 2 8-inch rounds on the parchment paper using the bottom of an 8 inch soufflé dish (the one you’ll be using) as a guide. Beat 2 egg whites until they form stiff peaks. Stir together ground almonds and sugar and gently fold into beaten egg whites. Divide batter evenly between two circles and spread gently make 2 8 inch rounds. If you have a pastry bag and ½ inch tip, you can squeeze the egg white mixture out through the pastry bag. Bake until crisp, about 1 1/2 hours. Cool on a rack. Peel away from parchment. Puree all but a few raspberries – save a few for garnish. Transfer 2 Tbs. of puree to measuring cup. Strain remaining puree into mixing bowl, eliminating all seeds. Add enough strained puree to the 2 tablespoons unstrained to measure 1/2 cup. Add the lemon juice to the ½ cup puree and set aside. Chill remaining strained puree, which will be used as sauce. In a small heavy saucepan combine sugar, water, and corn syrup. Bring slowly to boil over medium heat, stirring occasionally and brushing down any sugar crystals from sides of pan with brush dipped in cold water. Raise heat slightly and cook until temperature of syrup reaches 240 F (soft ball stage). While syrup is cooking, beat 3 egg whites in a mixer until stiff. As soon as syrup reaches 240 F, lower mixer speed to slow and pour hot syrup onto beaten whites, in a very thin stream. When all of the syrup has been incorporated, raise mixer speed and beat meringue until cool. Stir in the raspberry puree. In second mixing bowl, whip cream until stiff and fold into the meringue until blended. Do not over-mix. To Assemble:, Fold sheet of parchment or waxed paper in half lengthwise and lightly oil one side of paper and wrap it around souffle dish so it extends about 3 inches above top of dish, taping it securely with masking tape. You might also attempt this with non-stick foil. If it works, let me know! Masking tape and parchment are tricky to work with. Spread 3/4-inch layer of mousse in prepared souffle dish. Stack a meringue layer on top of the mousse. If it doesn’t fit, trip it a little. Repeat, adding mousse, then remaining meringue layer which should be at the top of the dish but not the collar. Top with remaining mousse, smoothing it gently with spatula. Freeze at least 3 hours. To serve, carefully remove paper collar. Smooth exposed edge of souffle, if necessary, with a metal spatula. Use a knife blade or long metal spatula to score shallow crisscross pattern in top of souffle. Garnish with reserved raspberries. 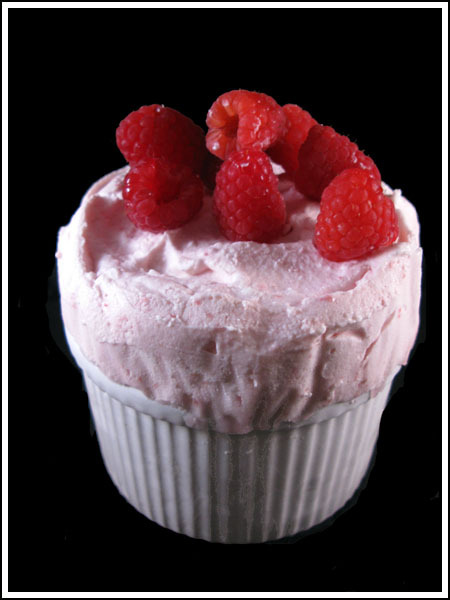 Serve in wedges, spooning a little of the chilled raspberry puree around each portion and serving remainder separately. Well, thanks for the nice comments. If you make this, let me know. I’m already brainstorming ways to use just the raspberry mousse part. The meringues were good, but the mousse itself was excellent and might be a good filling for a white chocolate raspberry mousse cake or something along the those lines. Anna, you truly outdid yourself with this one. But just checking, re: Katrina’s comment: it is pronounced “Souffle Glace Aux Too Freaking Hot,” n’est-ce pas? I’ve never seen something like this before, so clearly I’m going to the wrong kinda places! Anna, I usually hold my tongue when I visit but I just had to break my silence and say well done. This is just gorgeous. Thanks for the nice comment and good luck with the frozen souffle. When you don’t feel like fancy desserts, you will find plenty of peanut butter cookies and lop-sided cakes here as well. For the best results, head straight to the All Time Favorites post. I’m still working on it, but the things in that list are all very good. ARE YOU KIDDING ME WITH THIS BLOG!?!? I just stumbled across your blog while searching for yummy, unique baked creations… I’M IN LOVE- or maybe lust?? I am a BUSY 22 year old non profit committee head.. So when I get hours at a time to dedicate to my 2 year old- WE BAKE OUR BUTTS OFF! Thank you!!!! I’m so SICK of peanut butter cookies and lame, lop-sided chocolate cakes (that ultimately sit on the counter for a week before I sacrifice them to the crappy cake Gods). what and elegant and refreshing dessert! it looks perfect for summer when you want something light but flavourful. i think you could also make this with just about any other berry (most berries pair wonderfully with the sweetness of a meringue) or even a slightly twisted version with summer stone fruits like peaches or nectarines. for those who do not like to share their desserts – i think you could do these in indvidual sized ramekins as a petite version. That is so pretty! No doubt the 3.5 inch size is much cuter than the 8 inch size. Todd loved this! I just had a few bites and thought it was really good too — there was lots of textural contrast. This reminded me more of a dacquoise than a souffle. In fact, I think the only think souffle like about it is that it’s piled up in a souffle dish. But I’m not going to argue with whomever named it because I don’t know much about frozen souffles anyway. LOL. I do wish more restaurants would serve dacquoise and I am not a mission to make reservations at restaurants that have it no their menu. Gosh…that is beautiful. Someday I really must get down to trying a souffle. I am sure of failure but you say it is easy? Hmmm…will have to try. That looks awesome! And quite the sophisticated name that I’m positive I’m not pronouncing correctly. Did you like it?